Chet Kiefer, the President of Kiefer Landscaping L.L.C., started mowing lawns with his brother Chad at the age of 7 and has continued mowing lawn and trimming shrubs since. Chet went to college for business at Lake Land College in Mattoon, IL. While going to college he decided to focus on the lawn care business full-time. In 1991 the decision was made to open up Kiefer Landscaping. Since the beginning we have focused on quality, service, and fair prices. We believe that if we don’t take care of our customers someone else will, and this mentality has kept us at the forefront of lawn-care and customer service in Central Illinois for the last 27 years! 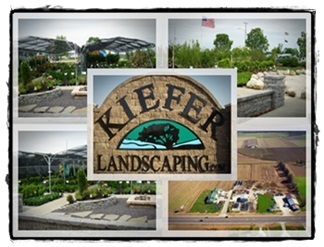 Kiefer Landscaping has a 5 acre garden center with many different shrubs, perennials, shade trees, ornamental trees, stone, brick, and retaining wall stone. We have 8 different decorative landscape rock types to choose from and we also carry brown mulch. We offer a variety of rocks for boulder lettering, which can be done across the street at Pyramid Marble! Our online store has many different landscaping and lawn & garden items to browse through. We have been told by many different customers that the selection of products and the quality of plants is the best they have seen in the area!